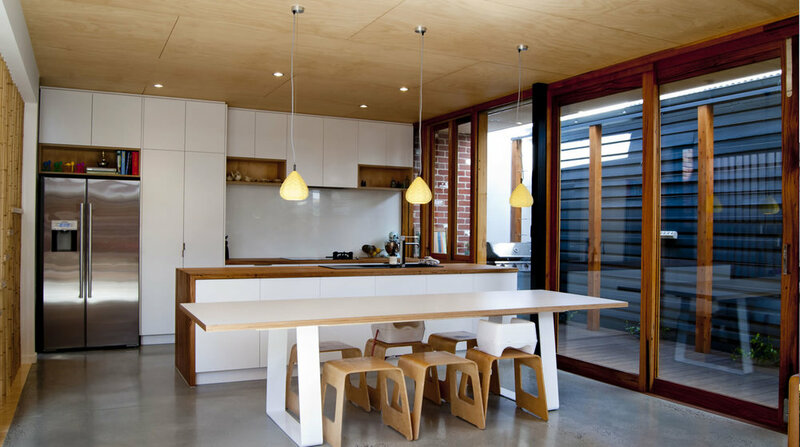 The Stead Street residence in South Melbourne, completed in 2012, is an extension of a federation style double fronted terrace house for a young professional family. The design focused on using environmentally friendly materials with a mixture of blonde bamboo timbers, recycled brick, blonde plywoods and soft white finishes combining to create a mixed Scandinavian/modern industrial aesthetic. Outdoor break out spaces are linked to internal spaces and used to define the room volumes. A second level courtyard is sunk behind the oversized federation roof pitch which previously housed a leaky box gutter. The feature bamboo staircase divides the main adult living room and the children’s play space, as well as dividing the old from the new addition, acting as a threshold to the new design aesthetic. The courtyard and the light well behind the staircase provide a flood of light which continues throughout the new addition in stark contrast to the old federation house. ESD initiatives include reclaimed timber window frames, Class 1 Stringybark, high performance insulation above code compliance, plantation grown native hoop pine plywood with chain of custody certification, hydronic heating within the concrete slab combined with roof mounted solar heat tubes, solar photovoltaic panel, solar PV powered ventilation to internal drying room, reclaimed pressed red brickwork, rainwater tanks connected to toilet flushing, bamboo flooring, decking, screening and stair balustrades. Bamboo is faster growing than softwood and as strong as hardwood. It was specified from a renewable Australian source.